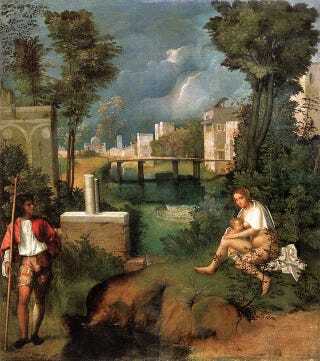 By Giorgione, an enigmatic sixteenth century painter. That first, “The Tempest”. Hailed as the first landscape painting in Western art, but it’s not pastoral, right? It’s so silent. It shouldn’t be. But it’s wildly silent. And! The last one, “The Three Philosophers”? That’s meant to possibly be Plato’s cave. But that black pit, or cave, or shadow, figures in these three seemingly unrelated paintings, as if they were different quadrants of a central absence. I love this guy.